Spray an iron skillet or similar size baking dish with cooking spray. Make filling: In a large bowl combine fruit, sugar, flour, orange juice and liqueur (if using). Pour into prepared skillet and top with bits of butter. Make biscuits: Combine flour, sugar, and lemon zest (if using) in a food processor and pulse to combine. Add butter and pulse until butter is incorporated. Add buttermilk and cream and process until just combined. Roll out dough on a floured surface to about ½ inch thickness and cut as many biscuits as possible, re-rolling dough scrapes as necessary. Nestle biscuits in fruit filling. Brush with 1 Tbsp cream and sprinkle with sugar. 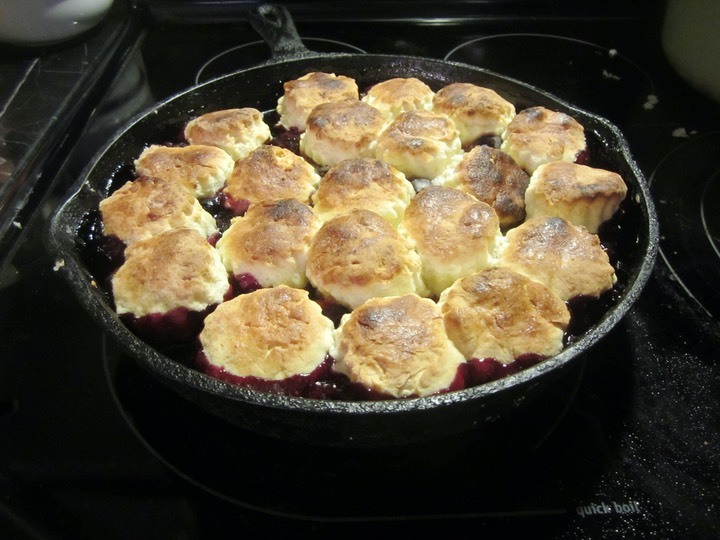 Bake 20 to 25 minutes until biscuits are browned and fruit is bubbly. Top with ice cream if you want to. Hope for leftovers – yummy breakfast!